Quick Snail Note: One of the products discussed in this post was provided as a press sample from Cupidrop. Check out my sponsorship policy if you’d like to learn more about how being given products for review doesn’t affect the honesty of my reviews. There is also an affiliate link floating around in here. I’ve been into essences and serums and ampoules for what feels like forever, but until recently, I thought facial mists were just silly. I didn’t see any purpose for them. My only conception of them was as something that people spray on their faces when their skin feels dry during the day, and in that case, they seemed totally pointless. Would the hydration (and any special ingredients) even penetrate through layers of makeup and sunscreen to benefit the skin? Wouldn’t evaporation take more moisture away from the face? I didn’t get it. Then the temperature started to rise, I got a facial mist as a gift with purchase from my bae Jolse, and now I have three, and I’m looking at some more. And then, of course, there’s Daesung. Add me to the list of reformed mist haters turned into mist fans. As you can see, they’re just the right size for all but the tiniest little clutches, too. In my day-to-day life and skincare routine, each of my mists serves a different purpose. Let’s take a look at the ones I own. Innisfree’s Green Tea Mineral Mist was, I believe, the first facial mist I bought. I caved and purchased it about the fifth time that it showed up in my Amazon recommendations, because at this point, Amazon knows what’s best for me. Innisfree Green Tea Mineral Mist comes in a small, light 50ml recyclable aluminum can. I’m not entirely sure whether it’s aerosol (that would surprise me, given Innisfree’s insistent eco-branding), but what I do know is that the can dispenses an ultra-fine cloud of product: a true misting, rather than a spritz or a spray. This ultra-fine mist makes the Innisfree Green Tea Mineral Mist the most refreshing of my three facial mists. The fragrance of the Innisfree Green Tea Mineral Mist is refreshing as well. The product features that signature clean, green, unisex Innisfree fragrance. The ingredients are signature Innisfree, too, with soothing, astringent, and antioxidant-rich plant extracts; Innisfree Green Tea Mineral Mist comes up totally clean in CosDNA. I love this mist for cooling and reviving my face whenever I feel uncomfortably hot. It’s the one that I take in my bag when I go out and the one I reach for the most throughout the day. Mr. Crazy Snail Lady loves it, too. It’s become a regular part of his skincare routine, and when we first discovered this mist, he managed to get through an entire can in the space of a week! Innisfree Green Tea Mineral Mist seems a little hard to find these days. It’s disappeared from Innisfree’s official global site. I did, however, find a jumbo 150ml can of it on Amazon for $13.98 plus free shipping (affiliate link). As a side note, Nature Republic’s Bee Venom Mist Essence, the mist I received as a gift with purchase from Jolse, is very similar to the Innisfree Green Tea Mineral Mist. The Nature Republic Bee Venom Mist Essence also comes in an aluminum can that dispenses an ultra-fine, aerosol-like spray that refreshes without any excessive wetness, and I like the fresh herbal fragrance of the Nature Republic just as much. I used Nature Republic Bee Venom Mist essence the same way I use the Innisfree Green Tea Mineral Mist and will very likely purchase another can. You can view the full ingredients for Nature Republic Bee Venom Mist on its CosDNA profile. Jolse sells the 50ml bottle for $10.78. It’s too soon for me to have posted any reviews about this brand, but if you know me from Reddit or follow me on Twitter, you may have noticed that I’ve developed a pretty intense thing for Tosowoong skincare products. That’s because Tosowoong makes clean, simple, affordable products with lots of proven ingredients. Tosowoong Propolis Whitening Mist is no exception. It looks a lot like the essence, and that’s because it is a lot like the essence. It’s basically the essence in spray form. Seriously, the ingredients are amazing, especially for an occasional-use product that few people would consider a serious skincare step. In addition to a generous helping of propolis extract (75% of the mist, in fact), Tosowoong’s Propolis Whitening Mist contains niacinamide, EGF, ferments, honey and royal jelly extracts, and Tosowoong’s proprietary blend of antioxidant-rich fruit extracts. Check out the full ingredients list and CosDNA analysis here if you want to get excited. Tosowoong Propolis Whitening Mist only falls short in two areas: the spray and the smell. Neither of them are bad, just less great than the Innisfree and Nature Republic mists discussed above. Tosowoong Propolis Whitening Mist comes in a simple plastic spray bottle. The spray button requires a little more pressure to depress than Innisfree’s or Nature Republic’s, and the spray itself is a quick (but still decently fine) burst rather than a soft mist. As far as the smell goes, well, it smells like ferments. That is to say, the mist has a distinct yeasty, almost beerlike smell. It isn’t unpleasant, but it isn’t my favorite type of fragrance, either. For those reasons, and because this mist has such great skincare ingredients, I keep Tosowoong Propolis Whitening Mist in my skincare basket. On very dry days, I pack in some extra hydration and niacinamide by spritzing it on in between some (or all) of my skincare steps. I also give myself a good blast in the face with this mist before applying a sheet mask or hydrogel mask. TesterKorea sells the 100ml bottle of Tosowoong Propolis Whitening Mist for 10,900 won (currently about $9.71 USD). RoseRoseShop has it for $12.54. This last mist was provided to me for review by Cupidrop, and I must say, I was predisposed to like it before I even sprayed it on my face for the first time, for one simple reason: PURPLE. Holika Holika Vita Up! Facial Water in Vita Violet is purple. I love purple. Purple is my favorite color. I sort of wouldn’t mind if the mist actually tinted my face a faint purple (but it doesn’t, so don’t worry). Purple almost makes up for the fact that the ingredients for this product don’t seem to be online anywhere (unless they’re in Korean, which I neither read nor speak). In fact, I asked my contact at Cupidrop whether she could provide the ingredients, and she let me know that she hasn’t had any luck getting them from Holika Holika so far, either. What we do know is that the Holika Holika Vita Up! Facial Water mists claim to provide “12 kinds of vitamin and mineral rich plant extracts” as well as a Japanese “miracle water,” Hita-Tenryosui. I’m never entirely convinced of the powers of “special” water–water is water, after all–but this mist does feel very soothing on my face, and when sprayed on and patted in before makeup, it does soften my skin and give it a lovely hydrated glow. 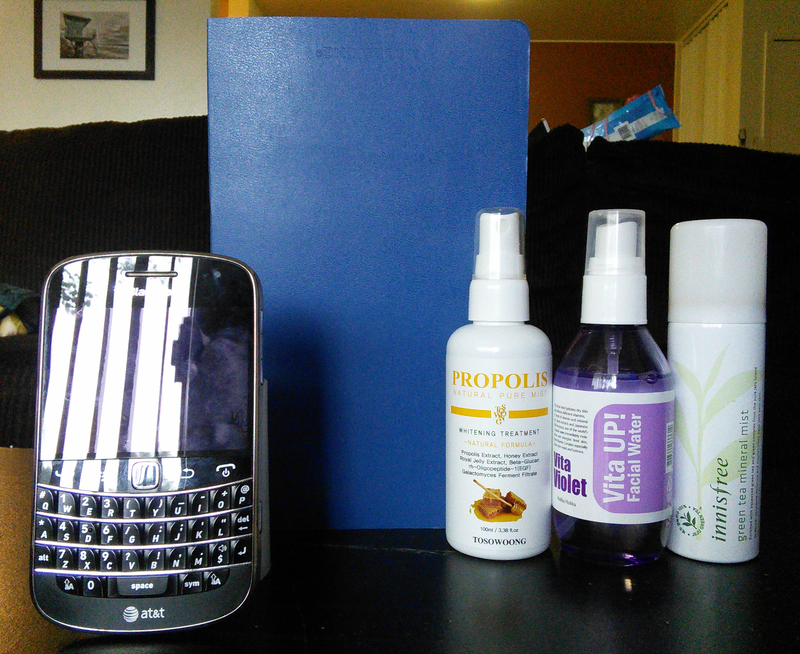 The spray bottle is comparable to the Tosowoong Propolis Whitening Mist. The button is a little harder to depress than Innisfree’s or Nature Republic’s, and the product comes out in a burst rather than an even mist, but the spray is quite fine. Also, it smells wonderful to me. The fragrance is the most feminine one out of all of my mists. It smells the way I imagine the color purple would smell: fresh, tart, and crisply floral. The only thing that could make cushion makeup more perfect? Cushion makeup with a mist. I usually keep my Holika Holika Vita Up! 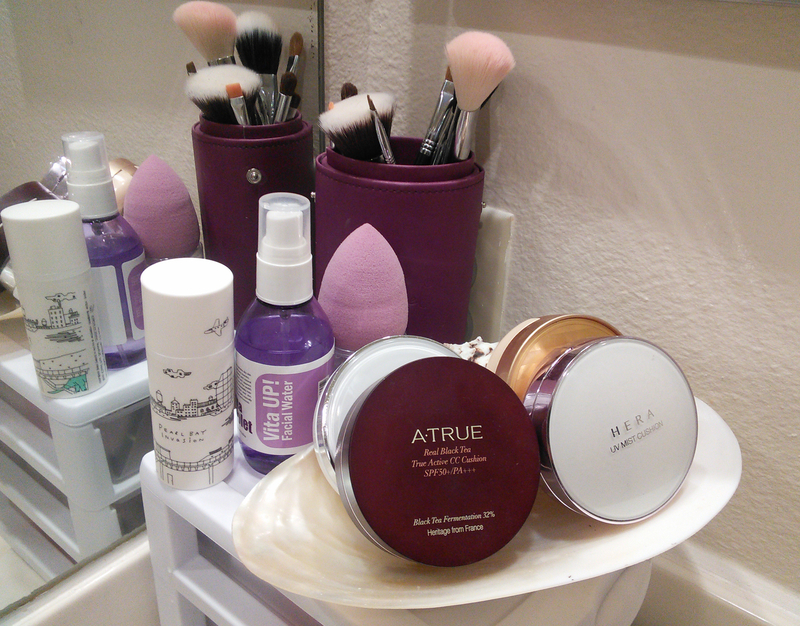 Facial Water with my makeup and use it to perfect my cushion makeup. I give my cushion puff a spritz of this mist right before I use it; lightly moistening the puff this way helps to prevent it from picking up too much product and results in an amazingly sheer, even, and glowy application. And though I don’t wear perfume, I do sometimes want to smell especially pretty, so for those times, I’ll replace the Innisfree Green Tea Mineral Mist in my purse with the Holika Holika Vita Up!, so that I can enjoy the fragrance while I’m out. Cupidrop sells the 100ml bottles of Holika Holika Vita Up! Facial Water in Vita Violet, Vita Green, and Vita Orange for $10 apiece. What’s your favorite facial mist, and what do you recommend I try next? I have the Avene Thermal Water mist, which is nice, but it’s very basic. I use it on my face and also on stray hair wisps that escape from the bun if I’m on the labour ward – I hate having loose hair in my face, but I’m growing out layers, so there you go. I’m not keen on hairspray etc so the Avene is good for that. I’m eyeing up the Mizon Snail mist and the Innisfree, although that propolis mist sounds amazing. I wish the purple mist smelled of real violets – I would be all over it. Or iris. Iris mist would be my Bae for sure! Oooh, the hair thing is a great idea. I always get wispy little flyaways around my face, and I’m not keen on hairspray either. I’ll have to try that! Thanks for the note about bidding on Tosowoong’s ebay store. Every time I recommend buying from it, I get worried that the days of getting items for the opening bid will come to an end. Waiting a day or two for the next auction without a bid is the right thing to do. Tosowoong for the lowest price for everyone! One question, I know Tosowoong’s mist says it’s a toner. Are the rest of the mists also toners or is there a difference? I do occasionally use my current toner which comes in a spray bottle throughout the day, but I’ll admit that’s mostly because I want to use it up and move on to my next toner, which is coincidentally Tosowoong’s Syn-ake Mist. Yes, I think you could use any mist as a generic hydrating toner, and vice versa, put a toner into a spray bottle and you’ve got a mist! I haven’t tried it yet. I”m trying to finish off another toner first. I’m glad to hear you like the essence. Tosowoong is the brand I find myself adding to my wishlist a lot lately. I think they have been overlooked, but their time is coming! My friend uses the Tosowoong Propolis Natural Pure Mist and I want to try it too. Looks really good. I’ve been looking for a mist for a long time and now I’m really interested in the Tosowoong one. You say they have an official eBay store, is it “tosowoongkorea” or “tosowoong”? I got a little confused since one is a top-rated seller and the other is not… ^^ I only buy from top-rated sellers because I feel it’s safer. Actually both of them are Tosowoong! The one I’ve been buying from is “tosowoong” though. I used to be like you…and actually still am. I’m still not sure mists do anything other than provide 30 seconds of gratification or sometimes being a nice layer before applying facial oil. The Hada Labo one is meh (can’t tell whether it does anything and spritzes coarsely). The Missha FTE Mist is nice if only for the very fine (faux-aerosol?) mist. Pixi Glow Tonic has lots of oils and some propolis and niacinamide in it, but pretty sure it doesn’t have as much propolis as the Tosowoong, which you have me lemming now. I’ve been hesitant to use that over makeup though because of the oils, but I’ll try one of these days for science’s sake. Could you test the pH of the Tosowoong mist, please? I actually did a few days ago, and IIRC it was right around 6–too high to use as an acid prep toner, but at a good level to bring skin pH down after using an alkaline cleanser. Aw man I miss my Innisfree green tea mist! I used to obsessively spray it all over until one day the nozzle started freaking out on me and spurting out water drops instead of mist, and since I was using it to set my makeup, it got demoted 😦 Nowadays, I just decant toners/watery first essences that I can’t finish up (or really, get bored of) into spray bottles and spritz away! That’s a good idea! BTW do you know if it is aerosol or no? That is a relief, and I doubt Innisfree would run the risk of intentionally mislabeling a product. I guess “micro mist” must be something totally different from aerosol then! Not sure how accurate this is but I did find this for the Vita Up ingredients. At first, tosowoong has got their good reputation from cleansing line. I think this brand is not popular in Korea, but it’s mania brand. I used soap and cleanser of it because of good review. If you have very sensitive skin, you should be careful to read its ingredient. In my case, in first month, face burn up and all face was covered by acne. Terrible… So, I called customer service center, and they said I should wait until face toxins disappeared. So I gave up to use this brand. I do not believe their explain…. I believe what I see. My face have to be treated over 2 month. Innisfree mist has no trouble yet, up to my experience. That’s very interesting, thank you! Do you remember which cleanser it was? I’ve just ordered the enzyme powder cleanser to try, as I’ve heard good things about this kind of cleanser. Awesome, thanks for that! I’ve been too afraid (for my wallet) to browse Memebox much lately. So, is the conclusion that mist is good for all day hydration? I am a recent K-beauty convert and trying to follow the 10 step skincare routine but for the day time of using emulsion + sunscreen (instead of emulsion + cream for night time), I find my face really dry during the day. Even after the first hour of applying my skin care and make up, I could feel that my facial skin is very tight. So, today, I impulsedly went and ordered the Missha First Time Essence Mist from eBay for approximately A$27 (from sing-sing-girl). Can the mist be sprayed over your make up or is it going to mess up the make up? I also want to know if these mist cans can be brought with me in my hand bag in the planes? I have seen signs that say no aerosol cans in hand carry luggage. I think the mist would be good for long haul flights! I would say that mists are great for instant relief (and fantastic for flights!). I do spray mine over makeup without a problem. And as far as planes go, I’m not sure that the aerosol-style ones like Innisfree’s would be permitted. I don’t think those are actually aerosol, but they look enough like it that I’d think you risk being told to throw it out. The ones in the simple spray bottles, like the Holika Holika and Tosowoong, should be fine as long as they contain less than the max allowed volume of liquid. Oooh I wish I had any left to answer your question 😦 I’m sorry I don’t know! I use Evian Natural Mineral Water Facial Spray. It is a metal aerosol can of water. The mist is a true mist, very fine and it feels great. However, the price is a bit much so I am thinking of just buying a small empty spritz bottle and filling it with Evian. It won’t be a fine mist but a spritz/burst should be good enough. Hi Fiddy! It’s time for a restock on mists; unfortunately, the faves have been discontinued and replaced with others. I’m in mourning over the Innisfree Green Tea Mineral Mist. I ordered 2 large cans from Amazon, but they had not arrived after two months. That said, please let us know if you’ve latched on to any others you’re loving. I just ordered the Holika Holika violet to get me through until another fabulous one comes along. I haven’t really been misting lately, but one that I really liked a few months back was the Nature Republic bee venom one if you haven’t checked that out. I got it as a GWP from Jolse back when they gave those out and was pretty sad when it ran out!